Olentangy’s Luke Riedel slices between Orange’s Bryson Lane (10) and Andre Irvin (5) during the second half of Friday’s OCC showdown in Lewis Center. LEWIS CENTER – Olentangy and Olentangy Orange did something a little out of the ordinary Friday night. The two boys basketball teams played a ho-hum game. There were no overtimes, no last-second shots and no crazy half-court buzzer-beater. An Olentangy 14-2 run to end the first half ended all of the drama. Austin Brown scored 19 points and added eight rebounds to lead Olentangy to a 72-57 win at Orange to knock the Pioneers out of OCC-Buckeye title contention. The logic is simple for Olentangy coach John Feasel. Good things happen when Brown is on the floor, sporting a plus-144 coming into Friday night’s action. Sean Marks scored five points and Brown added four to help Olentangy open the game 11-2. Bryson Lane scored 10 points as the Pioneers worked their way back to within 18-16 early in the second quarter. Brown and Luke Riedel traded baskets before Alex Sieve found Jack Hennegan for a layup as Olentangy ran off 10 quick points. Riedel added a 3-pointer from the left corner off a Sieve feed and Brown found Marks, who beat the buzzer to give Olentangy a 32-18 lead at the break. Brown added a put-back on Olentangy’s first possession of the second half before Orange found its touch again. Marks scored seven of his 15 points in the fourth quarter for Olentangy (11-8, 4-5), which led by as many as 19 in the second half. Marks also had three steals. Riedel had 12 points, Sieve added 10 points, seven boards and four assists and Caleb Steeled chipped in seven points and seven rebounds to back Brown’s effort for Olentangy, which has won three straight games. Lane did his best to keep the Pioneers in it. He scored a game-high 20 points and added four assists and four rebounds. 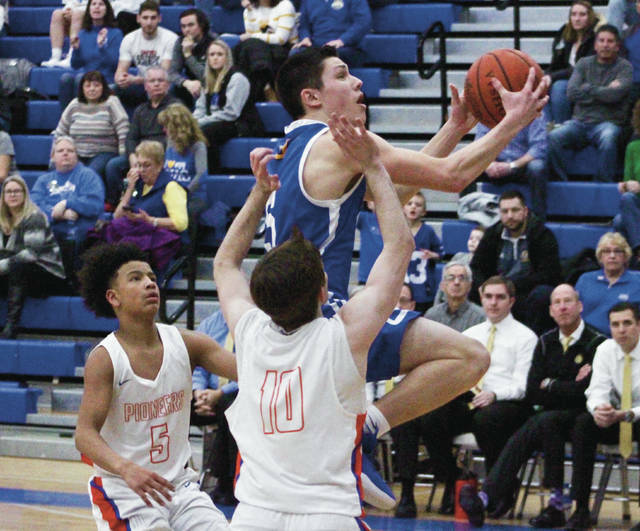 Ryan Cutler and Luke Ballinger had 10 points apiece for Orange, which got as close as 11 in the fourth quarter, but Olentangy’s free-throw shooting was too strong. Nik Brannon added eight points, five boards and a pair of blocked shots for the Pioneers (12-7, 6-3), who will finish second in the league behind rival Olentangy Liberty and ahead of Olentangy and the three Westervilles. Both teams face non-league competition next. Orange hosts Urbana tonight at 7:30 p.m. and Olentangy is back in action Tuesday at Marion Harding at 7:30 p.m.